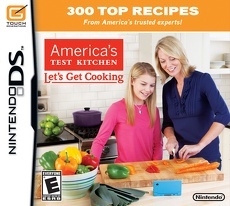 Rounding out our week of videogames and food is a look at the next culinary title to hit the DS, America's Test Kitchen: Let's Get Cooking. Let's face it: Cooking Mama isn't the best teacher. When Brendan Main wrote in his article this week about how he and his wife assembled a six-course meal of Japanese delicacies with Mama as his only guide, he may have left out a crucial caveat: "Your mileage may vary." Thankfully, if all you have is a DS and a kitchen full of ingredients, there's a better way. There's also sorting functionality that lets users rate their favorite recipes, view possible dishes by ingredients, difficulty, cooking time or calorie count and write notes with the touchscreen and stylus to add their own personal touch to the recipe. But perhaps the coolest feature is the ability to send select recipes from one DS to another, even if they don't have a copy of the game - so the next time you throw a potluck, you may want to make sure your guests bring their handhelds along. America's Test Kitchen will be available on March 28 for the price of $19.99. It's rated E for Everyone, although the ESRB notes there are "alcohol references." Could America's Test Wet Bar be far behind?